Nanaimo, BC – Less than 7 minutes after being placed next to a central Nanaimo business, a Nanaimo RCMP Bait Bike was stolen. Shortly thereafter, a Nanaimo man was found with the bike, and taken into police custody. Just after 10:30 AM on Tuesday February 5th 2019, the Bait Bike was placed in the vicinity of the Country Club Mall. Minutes later officers were alerted to the theft from a GPS tracker installed in the bike. A description of it was broadcast to officers and from the GPS information, a suspect was found with the bike and arrested at a location on Labieux Road. 28-year-old Zachary Morris of Nanaimo was arrested for Possession of Stolen Property and remanded into custody. On February 6th Morris pleaded guilty to Possession of Stolen Property and was sentenced to 90 days in jail. Bait Bikes, like Bait Cars, come in all sizes, makes, models and colours and can be placed anywhere. 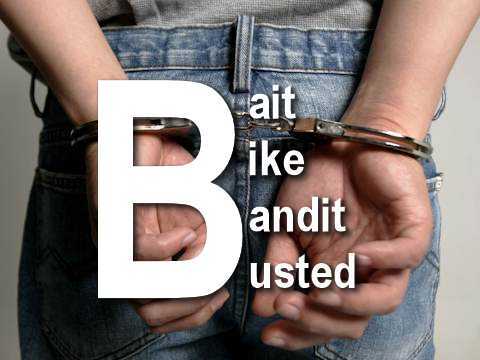 “Bait Bikes are just one of the many tools we have at our disposal to combat this issue. Our officers are continuing their efforts and ask the public to be an active partner by ensuring their bikes are secured with high grade locks and to always register their bikes with the 529 Garage App.,” said Constable Gary O’Brien of the Nanaimo RCMP.